Tumblr is one of the most popular blogging platforms that allows users to share short-form content and media files. With millions of active users and millions of blogs, Tumblr is now a source of quality content shared by the community of people. On Tumblr, you can easily share images, text, links quotes, videos, and music. You can also customize your Tumblr blog to give it a personal touch and better experience. For this, you can try Tumblr themes. To enhance the Tumblr experience, you have the option to use Tumblr themes. You also have the option to edit raw HTML to adjust themes. There are thousands of Tumblr themes to use. These themes come with lots of features, flat design, responsive interface, and several other features. In this article, I am listing some beautiful Tumblr themes you can try in 2017 ti enhance your Tumblr blog. Yuki is a grid based Tumblr theme for photography enthusiasts. On the home page, this Tumblr theme shows just photographs thumbnails. Users can click on images to know more about. If your share visual content or photos on Tumblr, you should try this Tumblr theme. Sugar is also a beautiful Tumblr theme that features good navigation and grid layout. It has responsive design to give better experience even on mobile phones. The theme has side navigation that looks cool. Verse is another free Tumblr theme. In this, you can choose your own header image to appear across the pages and posts. You have a custom sidebar that can be customized with images or other kinds of content. You can also easily integrate Google Analytics and Disqus comment system. It also allows you to show links to your profiles on Facebook, Twitter, Google+, Instagram and more social networking websites. Impulse is a minimal three column Tumblr theme for writers, photographers and portfolios. It comes with responsive layout and infinite scrolling. It has several theme options. So, you can easily customize most of the things. You can also set custom post backgrounds. Effector Theme is a feature rich Tumblr theme that offers more than 40 unique features. You will surely get all those features in this theme that you look for. Some of the features are the variety of layouts, options to customize, twitter feed, social icons and infinite scrolling. Ashley is also a beautiful Tumblr theme for all your blogging needs. It supports all available Tumblr post types. So, it is a multi-purpose Tumblr theme for sharing any kind of content. It comes with Google Fonts integration. Hipster from a company that shares premium themes but they offer this Tumblr theme for free. It offers nice features including sticky content, keyboard navigation, Instagram integration and much more. Simplify is the sleek and modern Tumblr theme with few nice features, It comes with cool navigation and support for Disqus, and Google Analytics. It is good for sharing news kind of content on Tumblr. 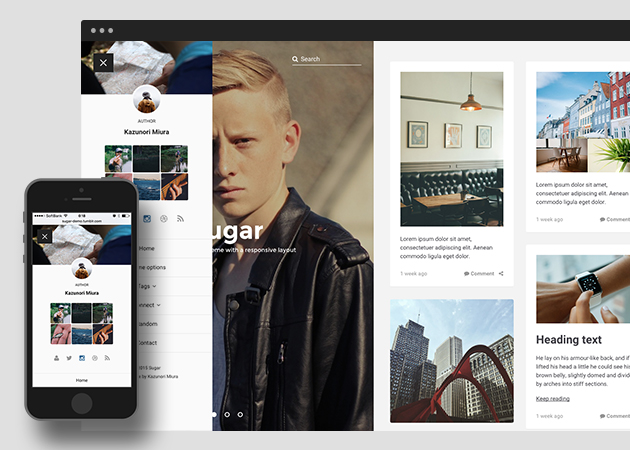 Gravity is a grid-based theme for sharing photos and visual content. If you are into photography, you will surely find this theme good. The theme is translation ready. It comes with easy customization options and supports mobile devices. Shiyori comes with infinite scrolling homepage. It delivers graceful content navigation experience. The theme supports all available post types on Tumblr and hence it can be used for any kind of content sharing. This is another notable Tumblr theme. Pation Grid comes with minimal grid design and sticky navigation. You can also turn on the Randomize Post Size option and the theme generates a new layout for each reload. It also comes with more than 45 font options and 3 hover styles. Indy is suitable for large post updates. It comes with three column layout and infinite scroll. It is responsive and shows single column on mobile devices. Pocket Folio is good for photographers who want to showcase large photos. It features multiple column layouts. The theme is responsive and offers nice experience. Sidebar Theme is a beautiful Tumblr theme with the sidebar. It has the custom design for each Tumblr Post type. It also has infinite scrolling. PopGallery Lite is a beautiful Tumblr theme with circles interface. As the name suggests, this theme is good for an image gallery, portfolio, and similar content. It has circle thumbnails on the homepage that looks beautiful. It has animated visuals and interactive interface. Modern Grid comes with modern interface, good look and infinite scroll. The theme is impressive with large color highlights. Silverlight comes with Owl Carousel Sliders to create content slideshows. It also has infinite scrolling and more features to make into the list of recommended Tumblr themes.